After spending six weeks aboard the SSV (Sailing School Vessel) Corwith Cramer, 23 days of which comprised our Atlantic crossing between Gran Canaria and Dominica, I’ve been finding it difficult to quantify all that I experienced and learned. I was aboard the Cramer as a guest “voyager,” a position that combined the roles of deckhand and visiting scholar. The Cramer is one of two ships operated by the Sea Education Association, an organization that runs semester-long programs for undergraduate students. Their voyages emphasize marine science, maritime skills, and cultural studies that vary based on changing cruise tracks. I expected to learn about sail handling, knots, celestial navigation, the physical world of shipboard life, and how it feels to be out of sight of land for weeks at a time. And I did. But I also learned about meteorology, pelagic birds, and the “plastisphere” that develops around discarded plastics in the ocean. I worked on diesel engines, cooked for a crew of thirty, and examined the many tiny creatures that appeared in our net samples (including such bizarre animals as mesopelagic nudibranchs, phronima amphipods, and megalope). It was easy to get excited about such things because everyone on board was passionate about their field of study, be it engineering, history, sailing, or science. Conversations around the dinner table and on deck moved easily from tall ships to Caribbean politics to the physics of rainbows to the Lego movie. I shared a bit of my own passion in such informal conversations and in a presentation about material culture during one of our daily all-hands meetings. I’m working on several reflective essays about my experience. In the mean time, I wanted to discuss what I worked on in spare moments between standing watch on the voyage: sewing and thinking about how and what sailors sewed at different points in history. 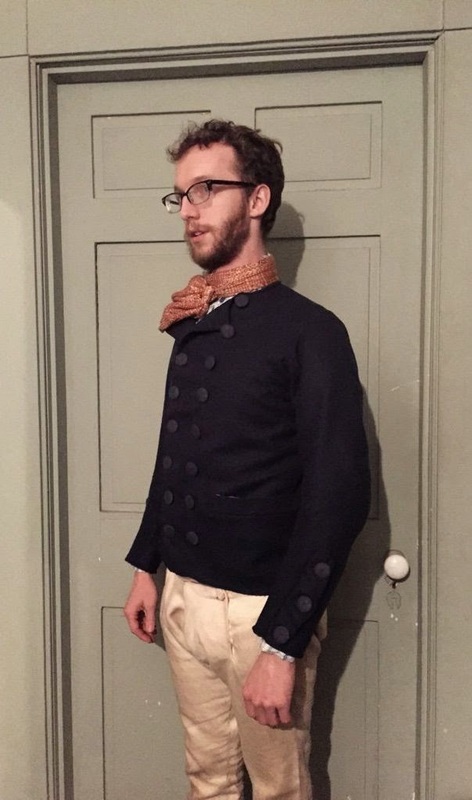 During my time aboard the Cramer, I completed a reproduction of a sailor’s jacket recovered from the wreck site of the General Carleton, a British vessel that sank in 1785. Historians Lawrence Babits and Matthew Brenckle documented the jacket in a chapter of the archaeological report available here. You’ll forgive the anachronistic beard and glasses in the images below. I wanted to sew on board the Cramer as a way of thinking about what it must have been like for sailors aboard earlier ships to make and repair their clothing amidst their many other duties. Shipboard life and labor meant sailors often wore peculiar styles of clothes, garments that distinguished them from other workers. Clothing still matters to sailors. Today’s professional tall ship sailors joke about looking like “schooner bums” when in port, and they can still recognize other sailors by the sorts of things they wear. Ships, historically and today, are cramped places, and people are amazingly creative when they are looking for a place to work. 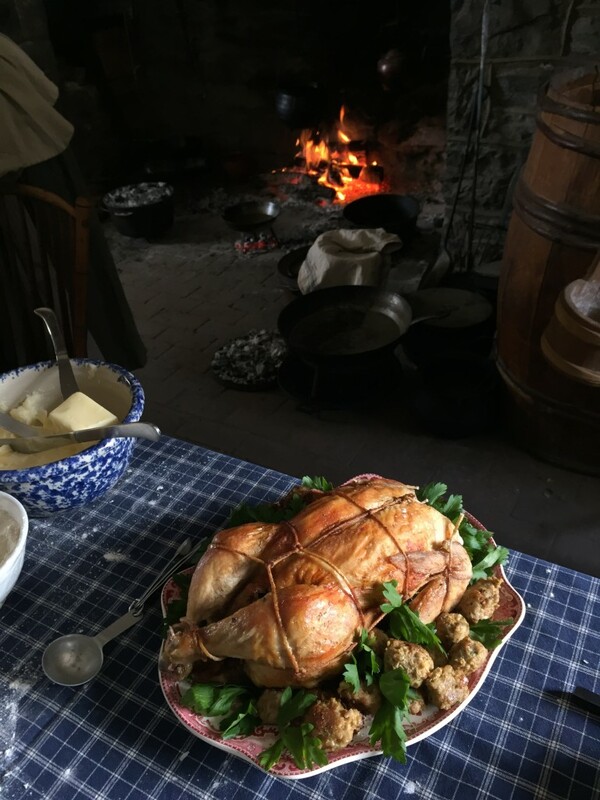 On the Cramer, people played music, wrote in journals, read books, and crafted in their bunks, at the dinner tables in the main salon, on deck, on the “elephant table” (a seven-foot-high platform behind the foremast), and wedged into impossibly small places in the metal and wooden confines of our environment. 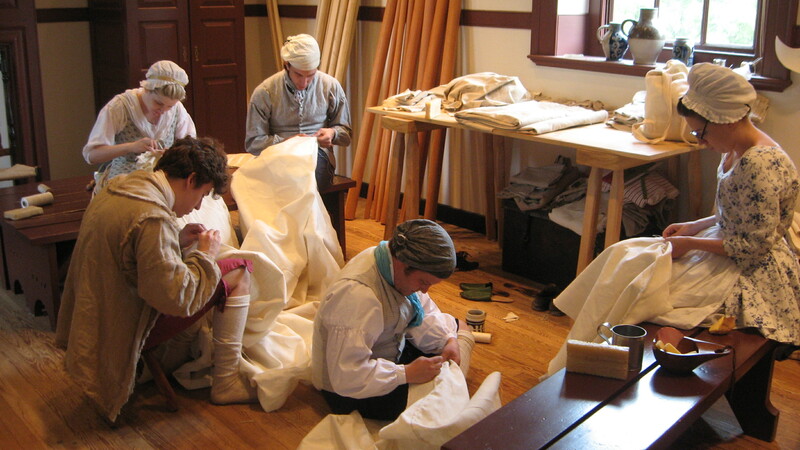 Today’s sailors, much like those of the past, sew out of necessity. 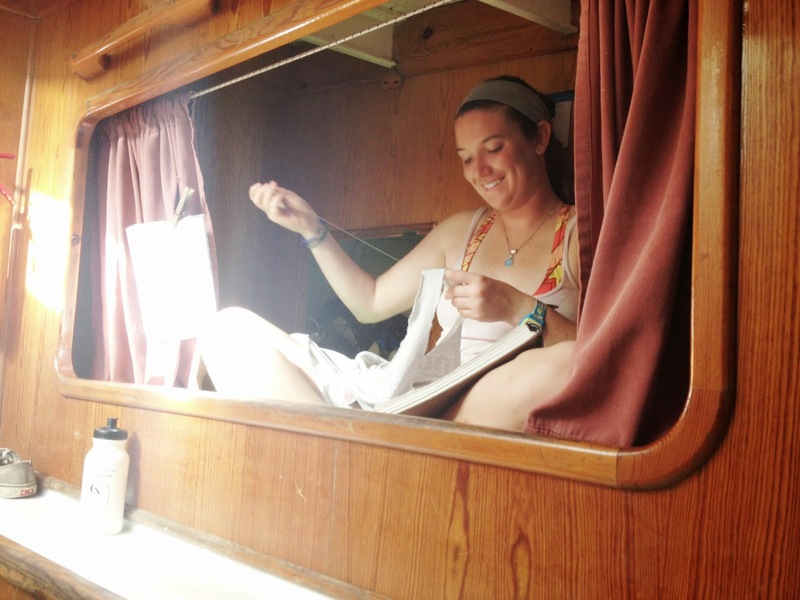 I was surprised how often I saw people sewing on board, given that most people I meet on land are unable to sew at all. There are several explanations for why sailors sew. 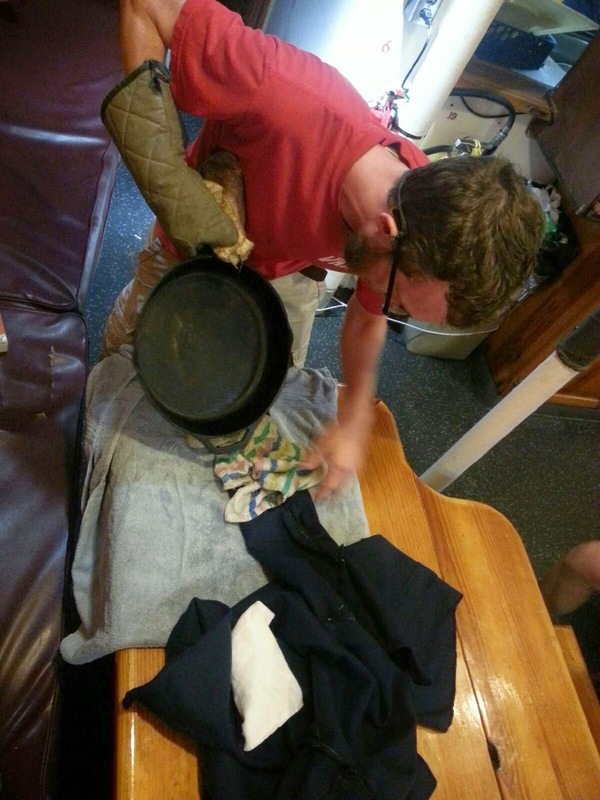 First, every crewmember has only a limited wardrobe and no recourse to a clothing store, so they have to repair damaged garments if they wanted to wear them again..
We had no washing machines aboard the Cramer, and so crewmembers laundered clothing in the open air of the deck. On any given morning, a handful of people enjoying their time off watch could be found sitting on the foredeck around small piles of dirty clothes or pinning clean ones up to dry on a line. It’s amazing what you can do with two buckets, some soap, and your hands. But there are other explanations for why people sew so much onboard ship besides functional ones. One afternoon, I watched as a sailor patched a pair of Hawaiian-print shorts on the quarterdeck. The cotton was hopelessly torn in multiple places, and several generations of stitches, sewn cloth patches, and adhesive sail patches covered portions of the seat and leg. But these were a favorite garment, and she had worn them through several voyages. Sailors often live and travel with far fewer belongings that most people on land, so some things take on substantial sentimental value. Many of the crew and students on our voyage studied how plastics entered and impacted the world’s oceans, and they were especially conscious about the wasteful nature of American consumer culture. All contemporary ships have to be careful with how much waste they generate, because they must transport inorganic trash such as plastics until they find a suitable land depository. We were very careful on the Cramer about what we used and threw away. 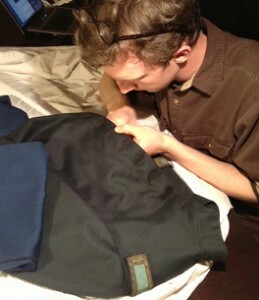 Crewmembers carefully repaired clothing at sea when such garments might have ended up at Goodwill or the dumpster on land. 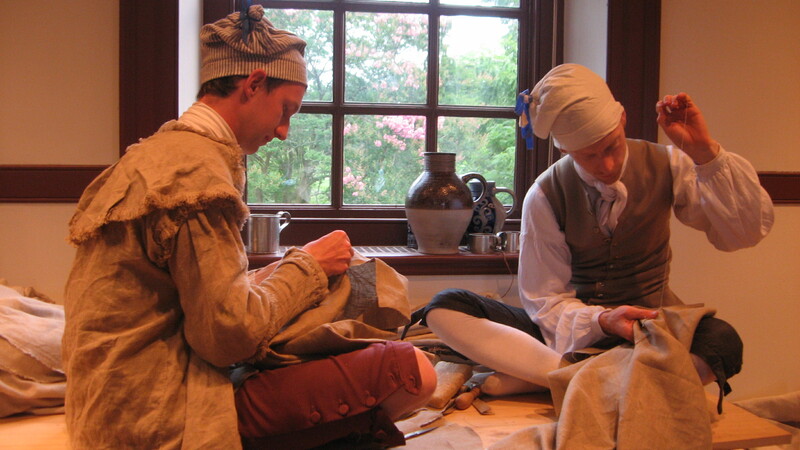 Depictions of earlier sailors at work and descriptions of their personal effects often include small boxes containing sewing tools. Almost as soon as I began sewing aboard the Cramer, I wished I had brought more small containers. Sewing doesn’t take many tools, but even a pair of scissors, some thread, and few needles seems like a lot to keep track of when you don’t have much space your whole world is rolling back and forth. I was constantly losing pins, though thankfully all were found by eagle-eyed and patient shipmates, rather than in the soles of some poor sailor’s foot late at night. 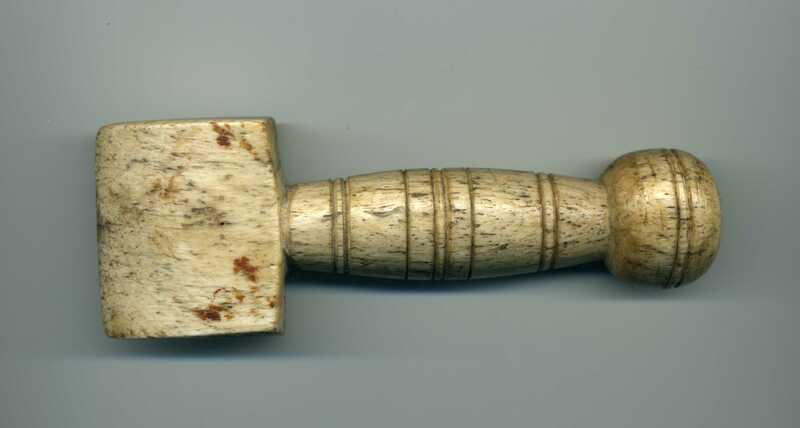 The only sewing tool lacked aboard the Cramer was an iron. 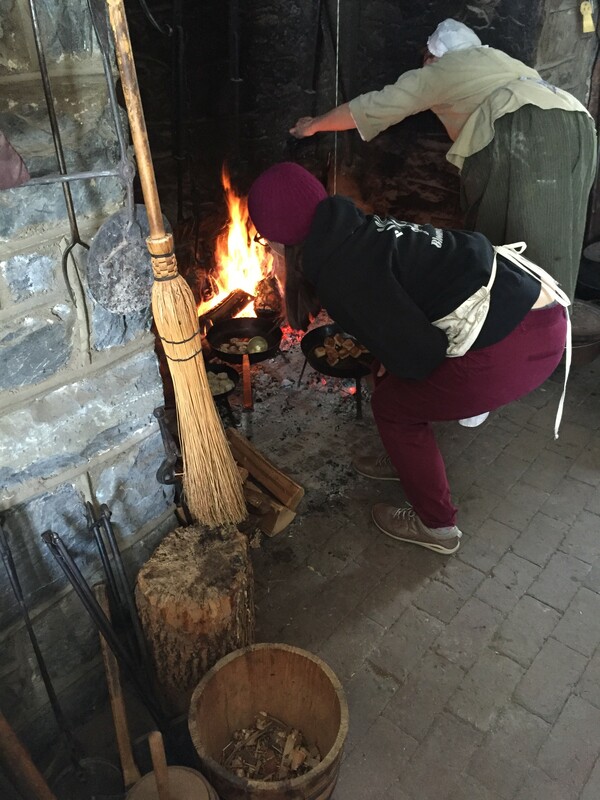 Historically, irons were just that – bars of iron heated in the coals of a fire or on a stove. 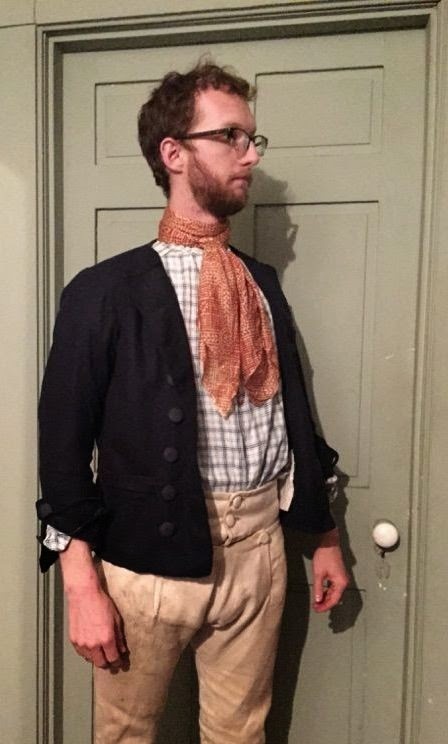 I suspect most early sailing ships had one, and my inability to press sewn seams made my Carleton jacket visibly different from the original and other eighteenth-century garments I’ve examined. A talented shipmate was kind enough to make me a wooden seam rubber, a tool that presses linen seams using pressure rather than heat and steam, but it was ineffective in pressing woolen seamst. 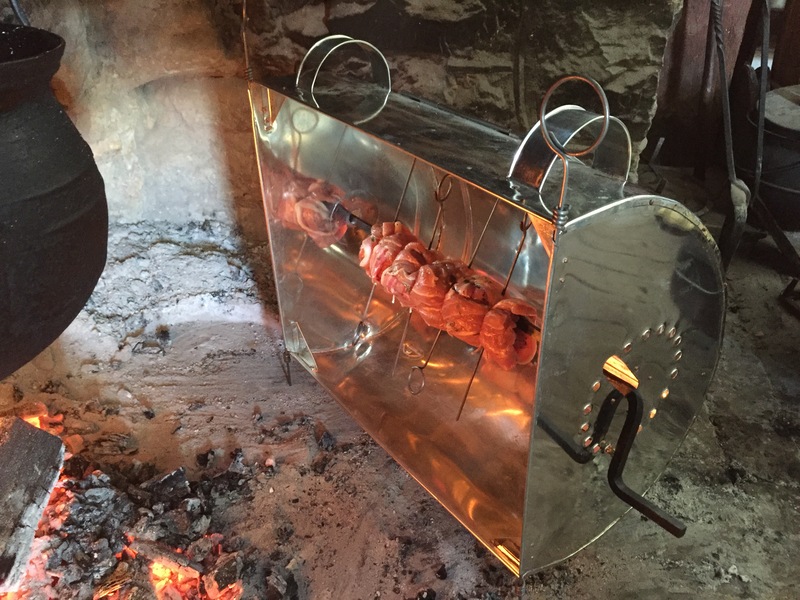 The most successful effort occurred when the steward, Nina, and I conspired to heat one of her cast-iron pans in our shipboard oven long enough to get it piping hot and use it as a make-do iron. 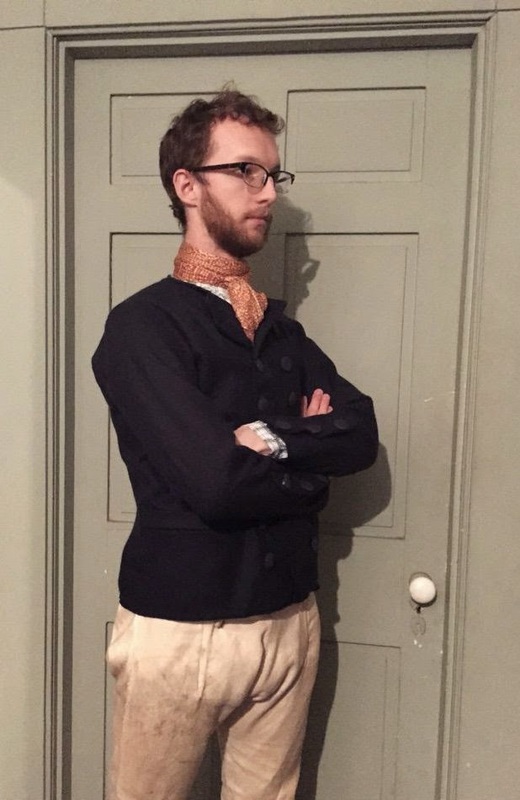 I had a file of research on the Carleton jacket and brought along all the supplies I would need to recreate it. Other sewing projects on board had less planning behind them. A few hours out of Dominica, we realized that our shipboard stores lacked the flag of that country. Typically, foreign ships visiting a port fly a “courtesy flag” as a gesture of respect to their host. With a small flag identification sheet as our guide, several of us went to work cutting up spare bed sheets and old t-shirts, assembling them into a one-sided rendition of the Dominican flag. Teamwork is hard work. Working and living together aboard a ship or otherwise can leave people embittered and unfriendly. But sometimes, the unpredictable chemistry of a crew produces a splendid result. The most valuable thing I learned while sailing aboard the Corwith Cramer had less to do with history, biology, metereology, or navigation. I learned that when you surround yourself with good people, anything seems possible. I did much less sewing on personal projects than I expected. But I’m most proud of a project I hadn’t planned, that Dominica flag. Where else could you find half a dozen people, most of whom had never sewn a stitch in their lives, ready to drop what they were doing, chop up old rags, and assemble a flag at a moment’s notice, all the time smiling? The result, like a good crew, sometimes looks ragged up-close, but when you step back and let the wind do its work, it is something quite beautiful. About the author: Tyler Rudd Putman is a Ph.D. student in the History of American Civilization program at the University of Delaware. 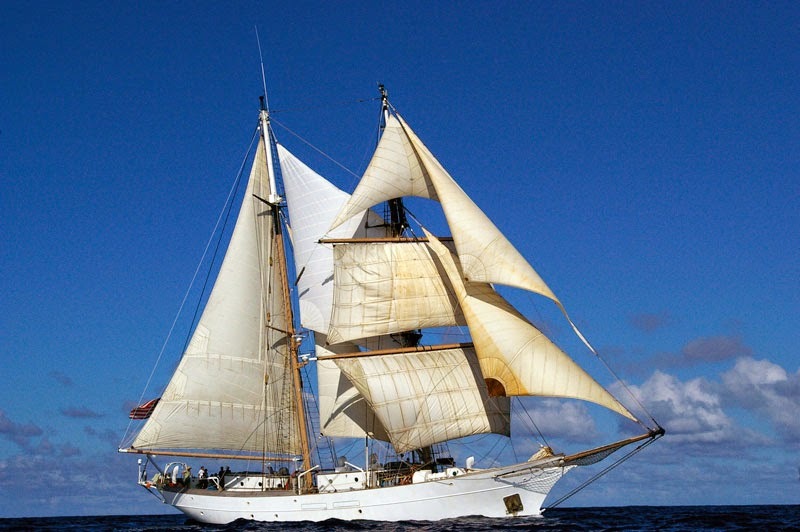 In 2014, he sailed aboard the Charles W. Morgan‘s “38th Voyage” and aboard the SSV Corwith Cramer during a transatlantic crossing from the Canary Islands to the Caribbean. 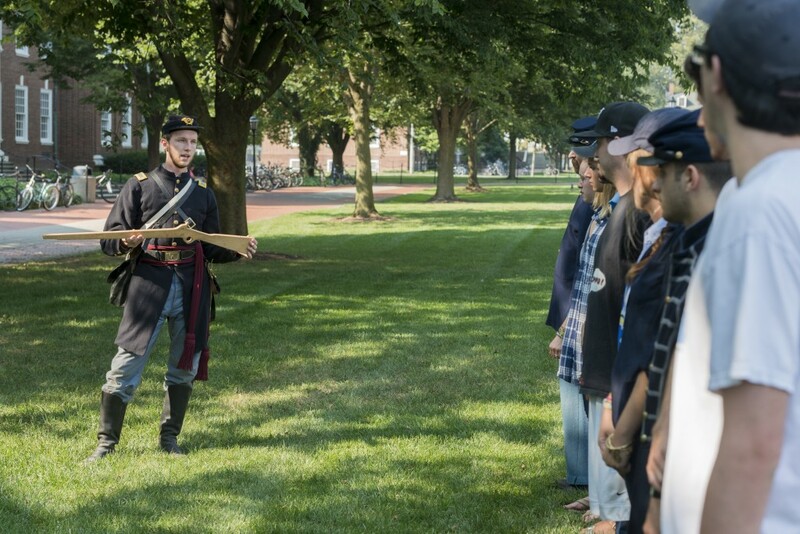 His research interests include material culture, historical archaeology, and military history. You can read more about his work on his website, here, and his blog, here.